Tsuga canadensis ‘Pendula’ pruned to grow wider than tall. Evergreen lovers of the world, unite! 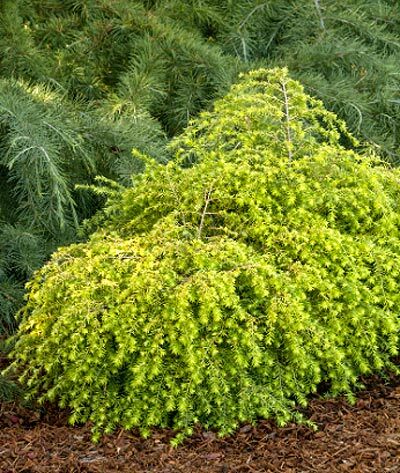 Unite in gaining appreciation for this large and varied collection of stellar, shade-tolerant evergreens that range from eye-catching, dwarf shrubs to majestic, mammoth trees. There’s a very special place in your yard for a Hemlock. A word on genus and species is in order. Tsuga is the genus, of course, derived from the Japanese name for Hemlock. No part of the plants classified under the genus are poison or related in any way to poison hemlock (Conium maculatum), which is a perennial in the carrot family. Genus is followed by the species – always lower case, and also italicized. The three most common species found in North America are T. canadensis, T. caroliniana (Carolina Hemlock) and T. mertensiana (Mountain Hemlock). The latter two species count only one tree each and a few minor varieties in their group. When it comes to T. canadensis, however, zone 3 through 7 gardeners have a very large selection of Hemlocks from which to choose. In fact, there are just over 250 registered varieties of Tsuga canadensis throughout the North American nursery industry, so I am presenting you a meager snapshot at best! To save my webmaster layout time, I’ll include a photo gallery at the bottom of this page. And yes, I’ll mention the pest woolly adelgid before wrapping up. 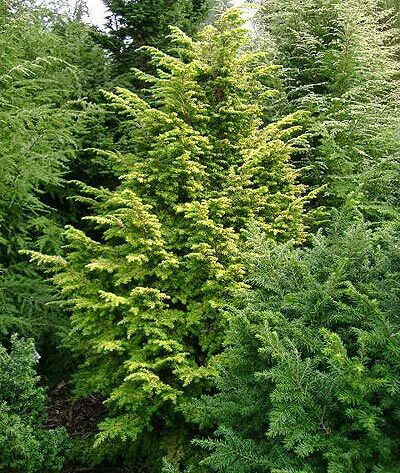 Tsuga canadensis ‘Aurea Compacta’ – A dwarf Hemlock with bright golden foliage and a jagged, upright habit. Sometimes sold as ‘Everitt’s Golden.’ Matures 6-8’ tall by 6-8’ wide. Extremely shade tolerant, though a few hours (up to a half day) of sunlight will bring out stronger gold color. Zones 4-7. 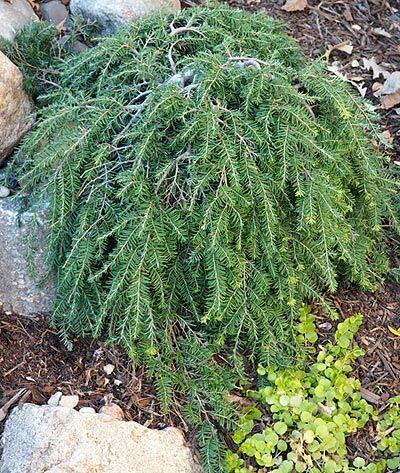 Tsuga canadensis ‘Cole’s Prostrate’ – Stiff, gray, weeping main branches are strikingly visible as you look down on this low-growing (24-30”) sculptural spreader with small, medium green needles. The plant will spread in undulating fashion out to 5’ or more. Killer combined with stone and placed near streams and waterfalls. Larger, similar variety is ‘Bennet.’ Part shade, Zones 4-7. 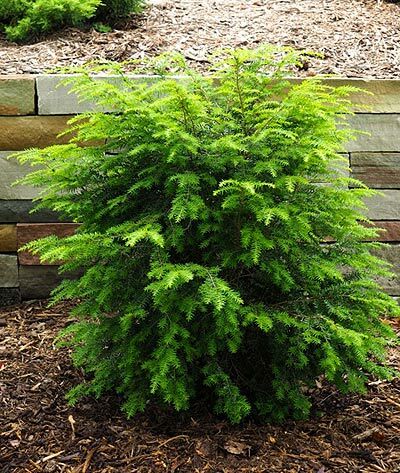 Tsuga canadensis ‘Emerald Fountain’ – An upright, columnar Hemlock with drooping green branches that give it a fountain-like appearance. Matures 6-10’ tall by 2-3’ wide. Can suffer from winter burn in zones 4-5; I recommend erecting a burlap wall on the plant’s south side the first two winter seasons, unless planted in a spot where it doesn’t encounter midday winter sun. For instructions (and photo) on how to do this, scroll down to the end of an archived article from the site you can access by clicking here. 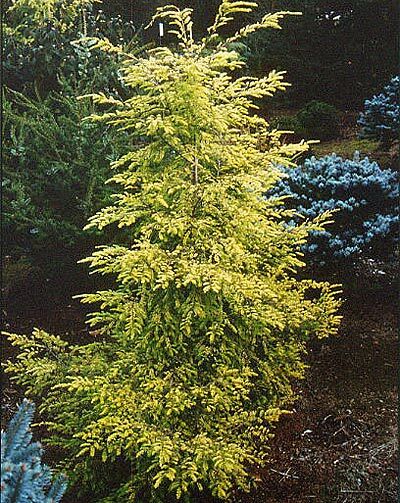 Tsuga canadensis ‘Golden Duchess’ – A small tree/billowing shrub useful in smaller yards and thrusting toward the front of the landscape picture. Dense, brilliant yellow, arching foliage, plants mature around 3-5’ tall by 3-5’ wide. Part shade, tolerates full sun if watering is maintained. 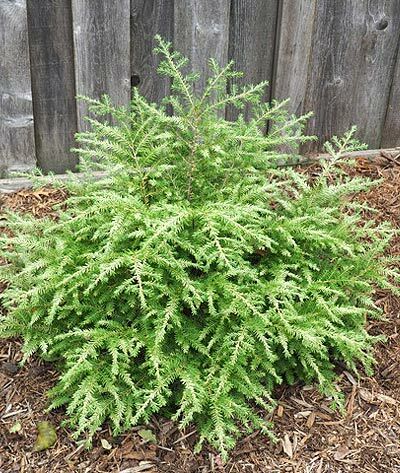 Tsuga canadensis ‘Moon Frost’ – One of my (and my clients’) favorites. A unique hemlock with dark green needles contrasted with white new growth in spring. This frosted-tip look holds up well through summer. In moonlight they are the damnedest thing you’ve ever seen. Shape is broadly pyramidal to globe, 3’ tall by 3’ wide in northern zones, upwards to 5’ in warmer climates. Part shade, Zones 4-7. 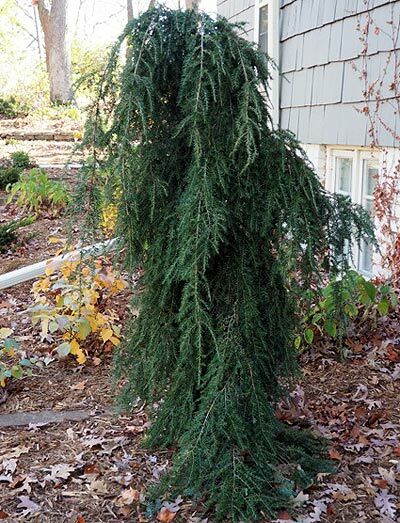 Tsuga canadensis ‘Pendula’ – The common name is Weeping Hemlock, and once you see one you understand what is meant by, “specimen plant.” They are big, bold, tall sculptures, and should be placed as such. Dark green needles cascade down in irregular fashion, forming a lovely Christmas tree skirt at the base. Mature size is 10-15’ tall by 6-8’ wide. Part sun to shade, Zones 4-7. Tsuga canadensis ‘Vermuelen’s Wintergold’ – Pulls off a neat trick: Plants turn bright yellow in winter, retaining this color into spring, before turning light green in summer. Upright form with gracefully arching branches. Popular in the Pacific Northwest. Part sun, Zones 3-7. All varieties are tolerant of various degrees of shade, which is one of the reasons it surprises me that more gardeners don’t include them in their shady spaces. Some tolerate full sun if grown in good soil and watered regularly, so ask at your nursery and do additional research prior to purchase and planting. Soil should include decent-to-ample organic matter content and drain well. Mulching around Hemlocks is always advised. 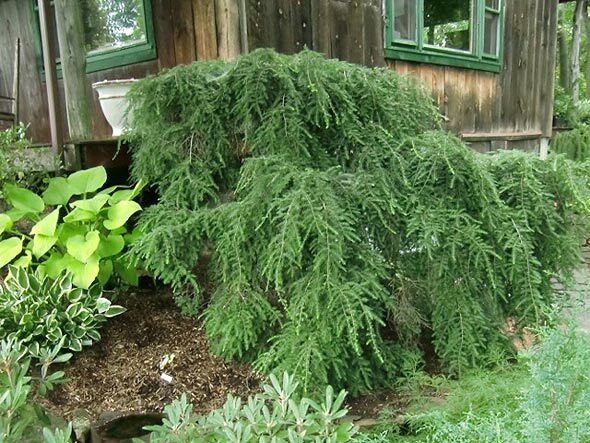 Virtually all the Hemlocks you will find in the trade are described as specimen plants, meaning you typically plant it as a single, although multiples of taller, larger Hemlock varieties planted as a hedge would be the exception. When you are placing a Hemlock you are placing a sculpture, so place it where all or most of the plant is visible in the broad view of the landscape. Sure sign of woolly adelgid. There is one pest of note: Woolly adelgid is a small, aphid-like invasive pest from Asia that got into the lower east coast of the US and has devastated the native tree population of T. Caroliniana. Bugs are tiny, ranging from dark, reddish brown to purplish black in color. The pest lays eggs and protects them with a white, wool-like coating that becomes noticeable on the underside of the outermost branch tips. If left untreated, plants are prone to death in a three- to six-year timespan. T. canadensis is also susceptible, but the pest hasn’t yet penetrated heavily into the central part of the continent or west coast, although it will. 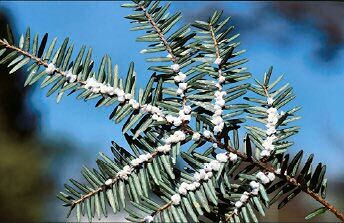 So keep an eye on your Hemlocks, and check the undersides of branches at least once a month. Control of the pest is simple with a variety of organic and synthetic chemical treatments.